Since playing CoG for such a long time, I think I should share some of my experiences and ideas with all of you. Firstly, letâ€™ see how to level up from level 1 to level 20 in an hour. First of all, enter COG, select your favorite race and come up with a brilliant character name, Here we go! After selected the race, created the name, when enter the game, a big-breast beauty came into your eyes. Welcome! Follow her guidance, letâ€™s take the adventure! 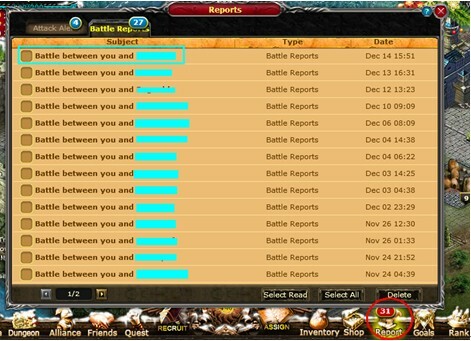 Take the first quest and follow the battle, you may somewhat get to know the point. Beat the first solider, finish the first quest, go back to the main city, and fulfill it, then you will be into level 2 right away. 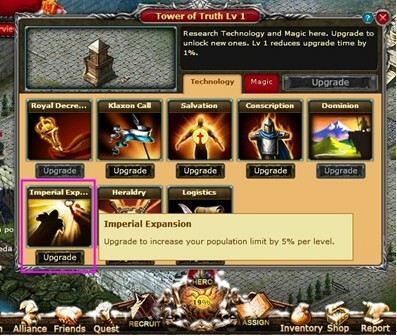 Now, letâ€™s follow the newbie guide to enjoy upgrades ! After you finish all of these, you will be level 7 then (Surprise! how fast it is!). From now, the beauty shall not guide you more here, what should you do? Donâ€™t worry, I am here with you. Iâ€™ve already mastered all kinds of formations to handle the situation and shortcut to level 20. 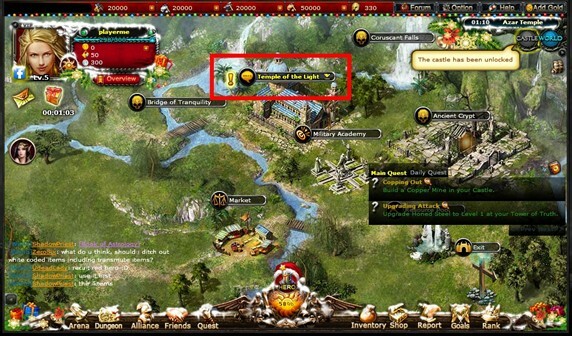 Btw, you could get a gift at the same time as the guidance disappears. This is very useful. It contains the newbie suit. 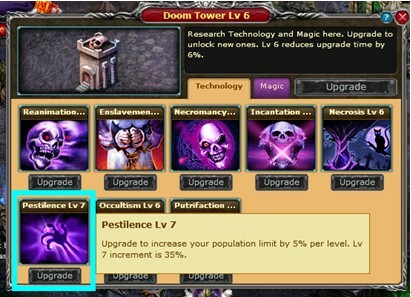 After equipping youâ€™ll be much more capable additionally, which help you at the beginning stage as a newbie so that you wonâ€™t see GAME OVER soon. Click the green NPC texts in the list (i.e. 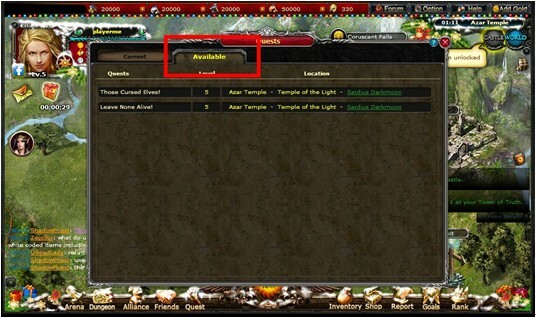 the Stark shown in the page below), the auto direct system will help you to find this Quest NPC automatically. 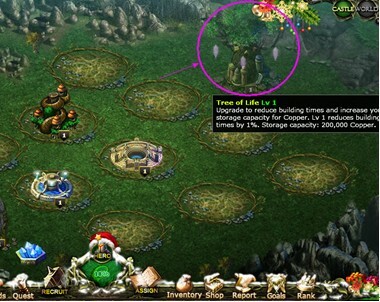 After you accept the quest, it appears an auto direct system at the right top corner of the screen; the system will show the quests youâ€™ve accepted on this page. If itâ€™s a simple quest to beat monsters around, you can click it name directly, and then the system will lead you to the quest NPC to start the original basic quests for the very beginning expedition army quests. When you reach level 8, Wheel of Fortune will be open; each player will have one-time free chance to spin the wheel. 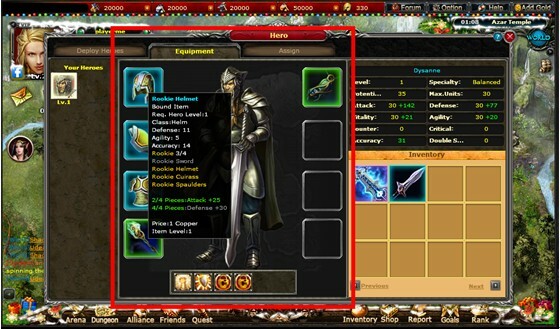 You will get some valuable items here, never ever lose this chance! 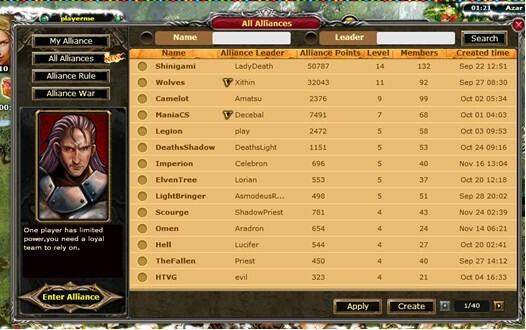 When you reach Level 10, Alliance and Dungeon will be available for you. These two features will be the next key parts in the game. 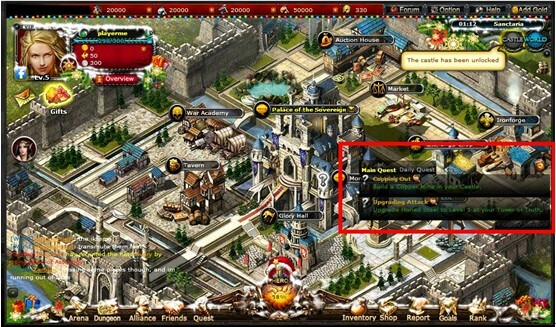 You can only gain EXP and level up by following quests; after level 10, you will face another option – join a great alliance. Why? Joining in an alliance, except that you could take alliance quests and gain more EXP, at the later stage, alliance could take up some area, which will be more benefits from you in near future. Anyhow, letâ€™s only focus on upgrade now! The other key part is Dungeon. 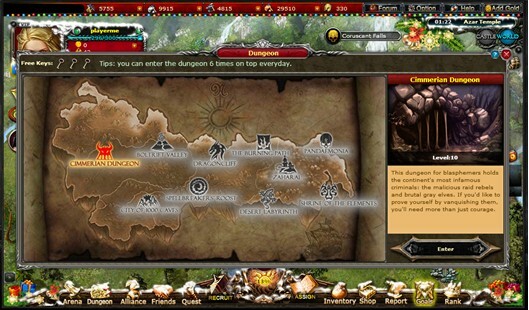 In COG, each level of Dungeon follows each 10-level Pass, and each Dungeon can be divided into three levels: Normal, Hell and Nightmare. 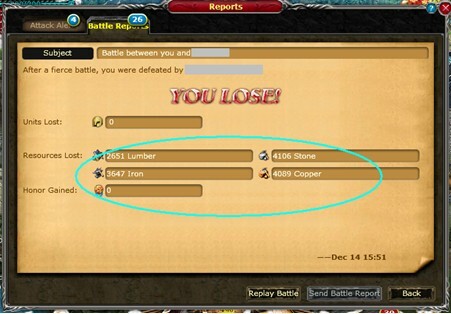 Of course, more difficult, more EXP and equipments you will gain. However, do NOT try to attack â€œHellâ€ before being ready and equipped well. 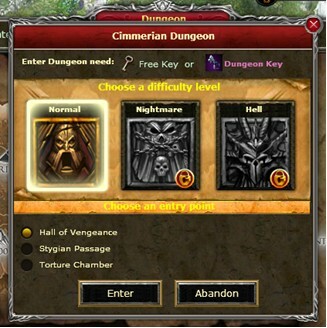 Of course, game is also specially designed that when each level of dungeon is not completed, you cannot challenge the next more difficult level! Furthermore, I believe it can be often found the situation as “not enough manpower” or “insufficient resources” in your expedition, how can we overcome and solve these problems? Let Mr. Know-all, me to show you the solution! 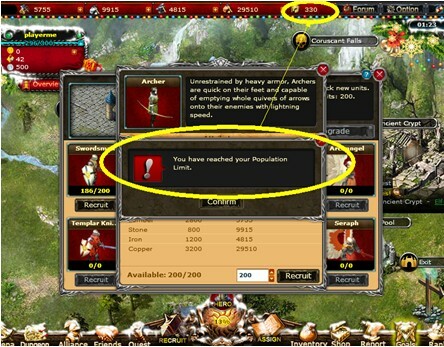 First, “Not enough manpowerâ€ is the mainly limited by in-game population, so if you want to increase that, it mainly rely on the construction or upgrading dwellings (corresponding to different buildings of different races, such as: undead named as tomb, Elf named as huts) to increase the upper limit of population. 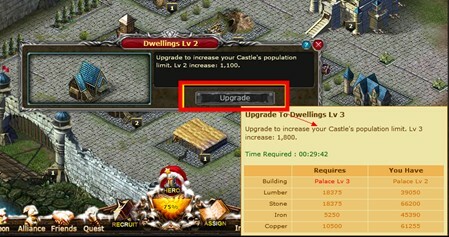 When you find some dwellings cannot be upgraded, you need to notice the red marked words, which may be from insufficient resources, or in the case as shown as follows, you have to upgrade other buildings ex: Palace to level 4, in order to successfully upgrade the dwellings! 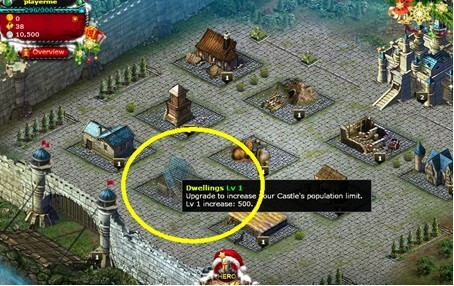 In short, my suggestion is not to give up any chance of upgrading the buildings! 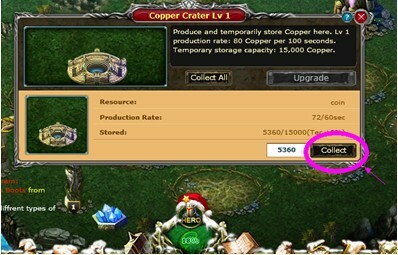 When it comes to “insufficient resources”, you must get into “Castle” in building construction or upgrading of resources (including: iron, copper, stone, lumber), for example, I often use the production of copper. 4.Because I am a lazy guy, so just used to click â€œCollect allâ€ for all the resources (click one key to collect 4 kinds of resource at the same time), fast and saving time! In this way, you only need to collect the resources in a regular interval; I believe that the resources will be as much as possible matching different resources cards gifted in the system! Finally, there may be some problems puzzling you, why I was often plundered by other players?! Then check out “Report” at the right side column among function keys. 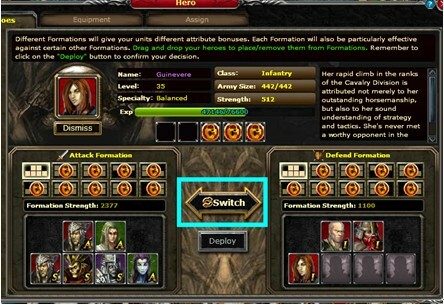 In fact, as long as you click â€œSwitchâ€ to exchange for current attack formation inside â€œHeroâ€ before going offline. 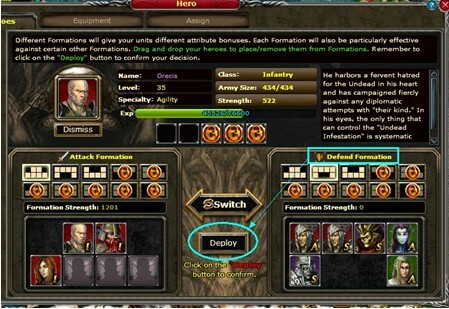 Now you successfully deploy heroes into “defend formation”. As long as your hero is powerful enough, then donâ€™t be afraid of plunders. 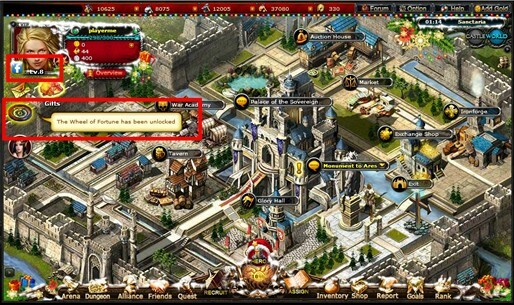 As long as you apply skills as described, you will be able to reach level 20 easily within an hour. Does it sound easy? Come with me to challenge!